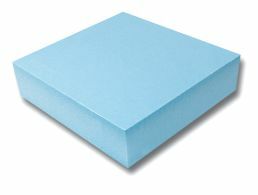 Extruded Polystyrene Foam is a closed-cell foam. Sold in 2" x 2' x 4' pieces and 4" x 2' x 4'. Cuts easily with blades, saws, hot wire (Do not cut in enclosed space) or other means. Ideal for wings, and general form creation. **Coat only with epoxy products or similar. ***Due to handling, some dents, marks or scratches may be present in surfaces.